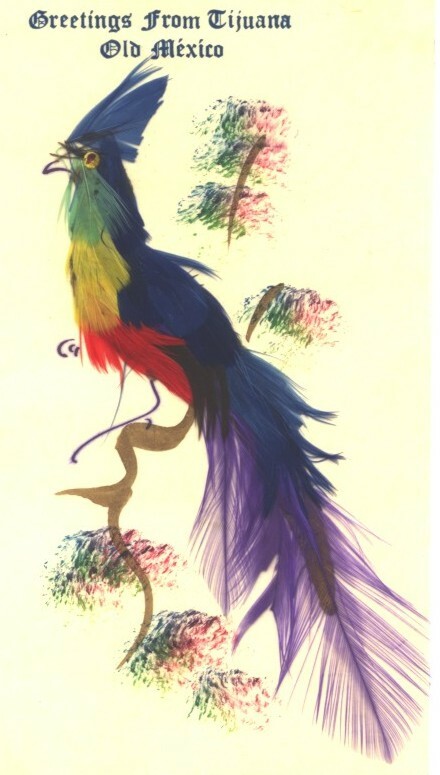 There are no exact dates of these postcards of birds made from feathers, or Feathercraft. These cards are the 1930’s to 40’s, but some think the 1950’s. They were handcrafted in Tzintzuntzan, Michoacan, but sold as souvenirs around Mexico. “Greetings from Tijuana” adorns one post card. Feathercraft is a very ancient art, the originator of which is said to have been Quetzalcoatl of the Feathered Serpent, a light skinned deity that taught the Toltecs their art. This took place many years before the appearance of Herman Cortes, the Spanish conqueror, way back in 1521, who himself spoke of the feathered jewels of the Toltec people in highly admiring terms. The Tarascans used feathers to adorn the robes and crowns of their Kings. Their Capital, up to this day, bears the name of Tzintzuntzan, or the Hummingbird.